Black and Tan Setters have been a recognizable breed since the sixteenth century. Alexander the fourth Duke of Gordon (1743 – 1827) is credited with producing an outstanding strain of Black and Tan Setters at Gordon castle in Scotland. The breed has been variously known as Scottish Setters, Gordon Castle Setters, as well as Black and Tan Setters and, as we know them today, Gordon Setters. The Gordon Castle Strain were mostly black, white and tan, a relic of the white can sometimes be seen today in the small white spot on the chest. In 1842 dogs from Gordon Castle arrived in North America and when official registrations began in the U.S.A. Gordon Setters were established. By 1891 the Gordon Setter Club of America had been formed and a breed standard written. 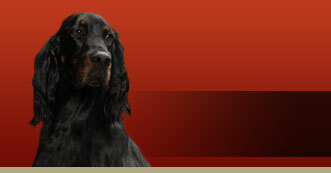 The Gordon Setter Club of Canada was first established in the early 1990’s. As a weight carrying hunter is to a thoroughbred racehorse, so is the Gordon to the other setter breeds. He is a dog with plenty of bone and substance, noble and dignified in his bearing. His coat and colouring make him an attractive and eye-catching dog. Regular brushing and trimming are all that are required to maintain his handsome appearance. Not a typical kennel dog, he must have affection for proper development and that affection is returned in full measure. He is a one-family dog and works best in the field for his owners alone. He has a strong protective sense towards family and home, though he readily adopts his owner’s attitude to strangers. Although unfriendly towards unwelcome intruders, he is to his friends “a most pettable dog”. He is an excellent house pet in spite of his size, and is ready to adjust to almost any living conditions as long as he is ensured the love of his owners. A keen hunter in the field, he is not restless in the house and will lie quietly asking only for the pleasure of his owner’s company and a necessary walk. This same well mannered gentleman is however, always enthusiastic about a day in the field or a ramble in the woods. He loves children and will suit his pace to theirs while protecting them from any threat. As a personal gun-dog the Gordon is without peer, although in the present form of field trial his habit of working thoroughly and not ranging too widely sometimes places him at a disadvantage. As a show dog, it need only be said that his is the inheritor of the legacy left by “Dandie” the Black and Tan Setter who won the first official dog show ever held in England in 1859.